A collaboration between choreographer/performer Jack Ferver and sculptor/set designer Marc Swanson, Two Alike is a composite and portrait of places and of snapshots. Each scene is filtered through the tortured and sometimes wonderful lenses of Ferver’s childhood experience. Janus is presiding over all beginnings, transitions, and endings whether abstract or concrete, sacred or profane. Here, it is a Janusface of chaos that unravels through Ferver’s childhood tale of fear, loneliness and frustration as a gay child resulting in isolation, insecurity even thoughts of suicide. This somber face is rendered with a black, visceral humoristic narrative through the magic of theatre. “I was never young: I hate everything,” proclaims Jack. Ferver’s understanding of semiotics and semantics as well as his word selection – “failure, or crack running, trigger is an interesting word” accentuated by their verbal repetition, obsessive, unrelenting, rigorist dance movement, infuse the play. His keen analysis of people and life pushes the boundaries of self-analysis and in particular the discourse on bullying and gay bashing – now a hot news topic – to the foreground. Janus’ brighter side supports all Ferver’s assimilation to the bright sky, the sun and the moon, the desire for growth, the desire to surmount life’s obstacles, challenges and assumption of one’s identity. Ferver’s sublimates them through dance where a cheerful Janus-faced thrives. The delicate but dense solo fluctuates between moments of intensity with typically Grahamian “Cave of the Heart” bearing – spiraling torso, wringing arms, gorgeous black cloth billowing – flecked with classical pirouettes: swirling steps and stylized gestures. In the rendition of the return of Oz, Ferver enacts his Freudian dreams, peeling them away then zooms around like a kid, first with great humor that is deflected by sadness, where, with each reenactment, he is brought gently to heel by sheer dance exhaustion and a desire for oblivion. Sculptor and stage designer, Marc Swanson erected a folding black screen and his twenty-two, thin, black wood strips affixed with mirror fascia hangs down throughout the stage. French conceptual artist Daniel Buren’s striped paintings, as well as designer Philippe Stark’s interiors, come to mind here. These strips are signifiers layering. The wood strips are reminiscent of the two artists’ childhood countryside origins left behind to confront the city with its dance clubs’ lighting strips. Mirrors of the soul, mirrors of the fragmented self, mirrors of the fragmented world, mirrors of one’s face, narcissistic mirrors to glimpse at one’s own shadow, audience gazing at its own reflection in the center of the stage mirrored wall, the whole palette is presented or inferred. Ferver’s interacts and dances around the sculptures, coming in and out from his dreams to reality, from the country to the city, from the night clubbing to the blaring day reality, from the shadows of darkness to light. Thus, the minimalist, austere and Spartan stage design is beautiful, a stark contrast between the inner emotional struggles and the whirling dances of the nights. Roarke Menzies’s hushed music at times is transformed into repetitive, unnerving beats pounding continuously as Ferver’s anger, fear, despondency mount, while the white lights impart a dream like equality to the sharper stage set design. Two Alike is a brilliant rendition of Janus’ two-faced duality that live side by side in each of us with all the binary dichotomy of internal and external psychological space, of push and pull, of high and low, of feminine and masculine. It is a transformative experience of dealing with fear, an aggregation to attempt digesting the almost indigestible social material that resonates equally with both homosexual and heterosexual alike making it part of our common consciousness. There is a ton of work that still needs to happen about how destructive xenophobia is – and we all want it to end. As adults, we are all responsible for its eradication. Alas, it can only be achieved with hope driving force and the good in humanity hence, Janus’s light side. 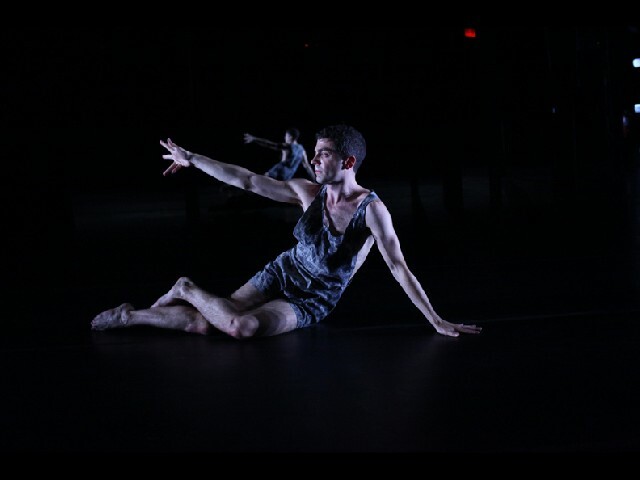 This fifty-five minutes dance-play performance is a co-presentation of the Institute of Contemporary Art/Boston and Summer Stage at Concord Academy. We are grateful for their foresight in promoting cutting edge, contemporary theatre.